Mohawk Group, a leading commercial flooring company, announced that George Bandy Jr. has joined the organization as its Vice President of Sustainability. George Bandy is the consummate sustainability leader on every level you can name. Mohawk Group, a leading commercial flooring company known for cutting-edge and innovative flooring solutions, announced today that George Bandy Jr. has joined the organization as its Vice President of Sustainability. Bandy has spent over 22 years working in the sustainability field, and has amassed a rich experience within the discipline’s concepts and practices as they relate to positioning environmental, economic and socially responsible solutions for business. He comes to Mohawk Group following 16 years with Interface, where he most recently served as the flooring company’s VP of Sustainability, and was also a member of Interface’s Americas Sustainability Council. In his role at Interface, Bandy traveled extensively as a highly sought after presenter on key topics including the business of sustainability, innovation in relation to nature, social sustainability and changing mindsets to a greener focus. Before working at Interface, Bandy was employed as the University Sustainability Officer for the University of Texas Health Science Center at Houston. He is the immediate past board chairman of the U.S. Green Building Council (USGBC), and has also served on the board for Second Nature, a non-profit that champions for higher education institutions to make the principles of sustainability fundamental to every aspect of learning. 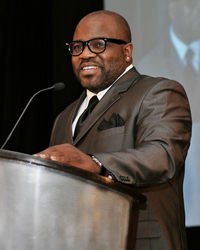 Bandy received his bachelor’s degree in English from Morehouse College, where he minored in Environmental Business Management. While in Houston, he also took part in continuing education training in sustainability. Additionally, Bandy holds LEED Accredited Professional certification from the USGBC. He is a native of Opelika, Ala.
Mohawk Group, the world’s leading producer and distributor of quality commercial flooring, delivers industry-leading style, cutting-edge innovation, unmatched service and superior sustainability. As the commercial division of Mohawk Industries, Mohawk Group has a heritage of craftsmanship that spans more than 130 years. The company’s enduring family of brands—Karastan, Lees, Bigelow and Durkan—are widely regarded as the most trusted names in the commercial flooring business. Together, these brands function beautifully, delivering the perfect flooring solution for all markets and price points. Rounding out its esteemed product offering, the Mohawk Group also offers a full spectrum of hard surface flooring products and installation accessories that exceed the most rigorous performance standards. For additional information about its proven design solutions, and to learn more about what is next from Mohawk, visit http://www.mohawkgroup.com or call (800) 554-6637.